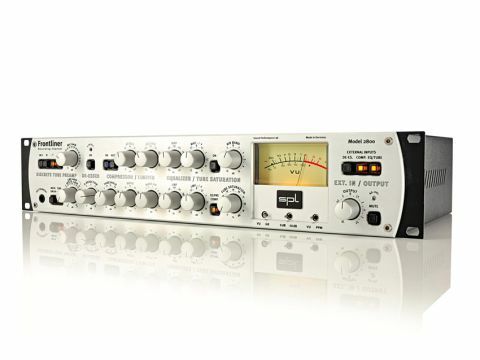 A flexible, hybrid, modular channel strip from SPL with a sound and tone to die for. Warm, deep tone. Modular I/O. Harmonic distortion. No digital I/O as standard. It has a role to play at the mix and even mastering stages. SPL have been busy of late, announcing no less than four new products at Musikmesse earlier this year. Among these is Frontliner, a new top-end channel strip to head up a couple of already impressive strips in their product range. Outwardly, Frontliner seems a channel strip like many others with a signal path which takes in a preamp, compression, EQ, de-essing and tube saturation, yet the big trick up Frontliner's sleeve is that each module can be accessed via independent I/O which means that as well as its capabilities as a tracking device for vocals and instruments, it also has a role to play at the mix and even mastering stages. The front panel features dials for these separate modules, which are clearly labelled from left to right with, lastly, the External In/Output sections. The preamp contains buttons to enable phantom power, phase invert, high pass filter and a pad, while Mic Gain can be dialled in from 0 to 68dB. If you're using an Instrument input instead, this can be plugged directly into the front panel, with a +15dB Tube button providing initial warmth. The De-Esser has an 'on' button and thereafter sibilance is reduced simply via a dial - there's no way to select exactly which frequencies to de-ess, though SPL's phase cancellation technology which lies at the heart of this process is wonderfully effective and musical. The compression section features Attack, Release, Ratio and Gain make-up dials, while the EQ section features sweepable low and mid frequency sections with cut/boost and generously wide frequency selection knobs. The 'Air Band' speaks for itself, allowing you to dial in or out some detail from the top end and this is accessed via its own on/off switch. The level of Tube Saturation is provided via a percentage dial, with the warmth of Frontliner becoming very apparent as you travel from 0 to 100%. A VU meter keeps you in touch with levels and its display can be switched from output level to gain reduction via a toggle switch. In use, this unit screams quality from the moment you plug it in. The sound is warm and, dare we say, 'expensive' from the off and as you punch in the modules you want during tracking, you can really hone a sound before committing it to your DAW. A touch disappointingly, there's no digital I/O as standard. However, SPL's own A/D conversion board can be added for a little over £100 and we're sure some purists will see it as an advantage that a truly analogue channel remains analogue to the end, without having to add the complexity of conversion. The sheer quality of audio provided here should convince any sceptics. What we like so much is that having used Frontliner as a tracking device, you can then re-patch at the mix stage so that, for example, your lead vocal could access the de-esser, your bass the compressor and, say, your lead guitar the EQ or Tube Saturation stages, making this a much more versatile unit than your average strip. However, the sheer quality will be its chief selling point and it doesn't disappoint - Frontliner produces a sumptuously warm tone which will add depth, colour and character to anything you throw its way.